Four years after their Olympic triumph in Sochi, Tatiana Volosozhar and Maxim Trankov of Russia have settled into a new life as parents, show performers, and most recently, he as a coach. The Russian pairs team were in PyeongChang last February to watch Aljona Savchenko and Bruno Massot succeed them on the Olympic throne. Trankov was commentating for Russian television and Volosozhar attended as a spectator. It was a new experience for both, but especially for her. After welcoming their daughter Anjelika in February 2017, Volosozhar and Trankov were eager to return to the ice that summer. They performed in Ilia Averbukh’s successful ice musical “Romeo and Juliet,” he in the role of the prince and she the princess of Verona. “We are grateful to Ilia that he gave us this chance to come back to the ice, which I wanted after giving birth,” Volosozhar said. “I got back into shape in the beginning of the summer at our home in the Iceberg Palace in Sochi — as we call it since the Olympic Games. Obviously, it was hard at the beginning, as my body was working in a very different way. However, I got back into shape and we even thought about competing again. But after skating for three months we felt we would continue our career most likely as professionals rather than as amateurs. Initially, there were no offers for the double Olympic champions to perform in shows, as producers did not expect them to come back so quickly after having a baby. But Averbukh did not hesitate to reach out the them and Volosozhar and Trankov embraced the opportunity. Averbukh’s production is not your typical skating show, in which everyone performs their routine with perhaps an opening group number or finale. 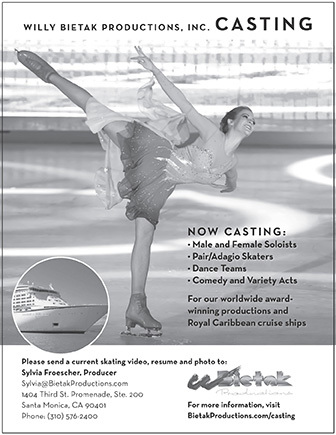 In this ice musical, figure skaters, ballet dancers and singers perform on and off the ice. The skaters also have to show their acting skills and some such as Trankov and Maxim Marinin (portraying Romeo), Alexei Yagudin (as Mercutio) and Roman Kostomarov (as Tybalt), took fencing lessons. Trankov also took part in Averbukh’s latest made-for-TV show “Ice Age Children,” in which 2006 Olympic ice dance champions Tatiana Navka and Kostomarov, Trankov and Averbukh taught a team of children. The youngsters, aged eight to 12, performed various skating routines and a vote decided who stayed and who was eliminated from the competition. When Nina Mozer, the head coach at the school where Tarasova and Morozov trained, announced following the Olympic Games that she would be taking some time off, the skaters looked for another solution. Since Robin Szolkowy, who had been working with Tarasova and Morozov the past four years, is not based in Russia and cannot permanently coach them, Trankov took on the job as their new coach. “Maxim’s life has turned upside down and then figure skating was added to it again,” Volosozhar said with a laugh. This caused him to initially hesitate to accept the job. After the 2014 Olympics, Trankov was interested in coaching and eager to work with Tarasova and Morozov, but Mozer decided to bring Szolkowy onto her team. “I was a bit upset because back then they just had moved up to seniors (2014-2015 season) and I did two programs for them,” Trankov said. Volosozhar wanted him to try it and eventually he was persuaded. Trankov agreed mainly because he sees it as an interesting challenge and realized he could not decline the opportunity. Tarasova and Morozov are his friends and Trankov did not see other coaching options for them in Russia. With Trankov performing in the ice show all summer, his skaters will follow him wherever he goes. In fall and winter, Volosozhar might partner with another skater when her husband has to go to competitions with Tarasova and Morozov. Nevertheless, she supports his decision to coach. “It’s good to try this different direction because Maxim and I are not planning to skate in shows for the next 20 years, but would still like to be connected to figure skating,” Volosozhar said. However, she said she is open to assisting her husband if he remains involved in coaching in the future. Right now, that is not his plan. “I’m just coaching Tarasova and Morozov. As soon as the Russian Figure Skating Federation officially announced that they would skate with me, of course I got calls from other teams, but I declined and I’m officially stating that I’m coaching just one team. For now, we agreed on one year and well see if we continue to work together. If it doesn’t work out, the guys still have three years to prepare for the Olympic Games with another expert. “Or when she sees some show she’ll probably say that she wants to try it and to be like mom and dad,” Volosozhar added. However, the couple is not too keen on the idea of having her follow in their footsteps and become a top-level athlete. Trankov feels the competition in ladies singles is too tough in Russia and Volosozhar doesn’t want their daughter to become a pairs skater.